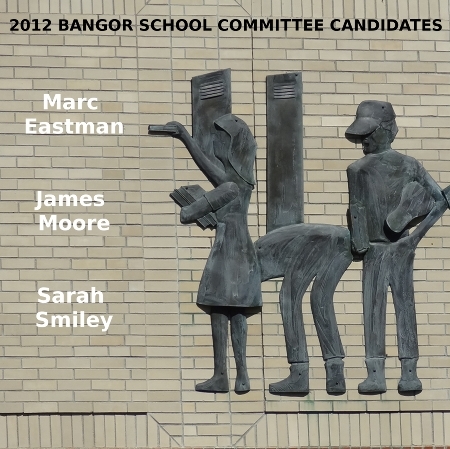 The 2012 Bangor School Committee Candidates - Click on a name! Do you know which two candidates you will vote to elect to the Bangor School Committee - Marc Eastman, James Moore, and/or Sarah Smiley? Click a name for more info or check out the School Committee Forum at City Hall Monday, October 29th at 6:30pm. (note date change!) Note: This imaginative relief is from the front of the James F. Doughty School. To view a sample ballot or for more information on the 2012 elections click on Vote2012 in the menu bar. Watch a video of the School Committee Forum mentioned above. Der Laden hat Probleme für mich gelöst, der Service ist sehr geduldig und es ist ein perfekter Einkauf. Replik Breitling Uhren Als ich diese Uhr erhielt, dachte ich, es sei eine gute Replikuhr.Replik breitling colt Uhren Ich mag diesen Online-Shop, diese Uhr ist einfach und großzügig. Sehr zufrieden mit diesem Kauf.